Tracing Your Georgian Ancestors 1714-1837: A Guide for Family Historians, published in March 2018 by Pen & Sword, is aimed not only at total newcomers to research before 1837, but also at readers with more experience who wish to improve their knowledge of the sources available and the relevant historical background. Fewer sources are available for researching ancestors who lived before 1837 than for those who lived in the Victorian era with its civil registration and census records. Church records included less genealogical information than civil registration records, and no national censuses recording place of birth were taken before 1851. Overcoming brick walls before 1837 often requires identifying very specific sources, as well as establishing where they are held or how they can be accessed. Furthermore, understanding the significance of information in earlier records often requires greater knowledge of the historical context than is provided in most general books on family history. Many years ago I recognised the need for a book focusing on the sources available for research in the hundred years or so before civil registration, which would also include relevant historical background information, and after several years as a professional genealogist, I decided to write such a book myself. 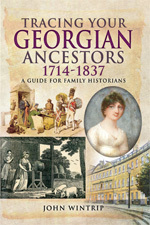 Copies of Tracing your Georgian Ancestors 1714-1837 can be ordered from booksellers or directly from Pen & Sword.